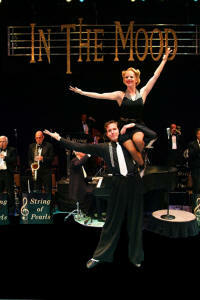 Oct. 6, 2009 -- The Fowler Center Series presents its third event of the 2009-10 season in Riceland Hall on Sunday, Oct. 25, at 2 p.m. with a performance of “In the Mood,” a 1940s musical revue featuring the music of the Swing Era. Riceland Hall, Fowler Center, is located at 201 Olympic Drive, Jonesboro. This appearance is part of the 2009-10 national tour of “In the Mood.” This performance is also part of the Riceland Distinguished Presentation Series, which was established to assure high-quality presentations in conjunction with the Fowler Center Series. An advisory committee meets semi-annually to evaluate the presentation series objectives, effectiveness of promotion and presentation of the series, and then selects four presentations to display its Distinguished Presentation moniker. 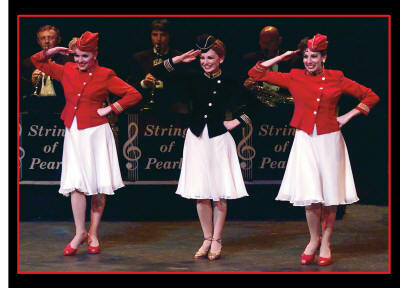 Much more than a concert, the big band theatrical swing revue “In the Mood” takes a retro look at the life and time of America’s greatest generation, a generation that was listening to and dancing to the music of Glenn Miller, Tommy Dorsey, Artie Shaw, Benny Goodman, Harry James, Erskine Hawkins, the Andrews Sisters, Frank Sinatra, and others. In the 1940s, on the radio and in theaters and ballrooms, these big bands drew record crowds. Vocal groups and soloists sang a repertory of great songs, and for the last time in the 20th century, the entire country shared a common popular music. This body of song did much to sustain national morale during World War II, the pivotal event of the 40's. With music and dance that ranged from up-tempo big band rhythms to mellow intimate ballads, the mood was set to inspire a future filled with hope, promise, and prosperity. This was a time like no other in our nation’s history, a time when music moved the nation’s spirit. 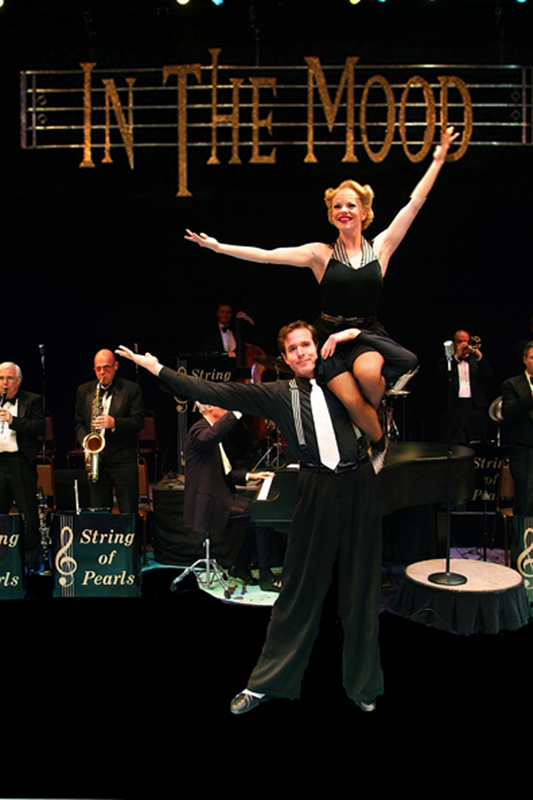 Audiences will experience the swing, rhythm, jazzy, brassy, sentimental, and romantic music of this important time. “In the Mood” was conceived by Washington, DC’s musical producer Bud Forrest. Many of the musical arrangements were written by Vic Schoen, the conductor and arranger for the Andrews Sisters and music director for both Universal and Paramount Pictures. The musical revue features the In the Mood singers and dancers and the sensational String of Pearls big band orchestra with arrangements, costumes, and choreography that are as authentic as possible. Bud Forrest Entertainment began touring the “In the Mood” revue in 1994, following an overwhelming response from a performance on the steps of the National Archives in Washington, D. C. For the 15th year, “In the Mood” continues to affect audiences, with sell-out performances everywhere. The National Archives in W ashington, DC brought “In the Mood” to their audiences as part of their commemoration of the 50th Anniversary of WWII, and the response was extraordinary, with crowds lining up for hours before curtain time. The engagement was twice extended to extra performances. In 1993, the Archives presented a repeat performance, out-of-doors on Constitution Avenue. Thousands attended, and many stayed to dance the night away. 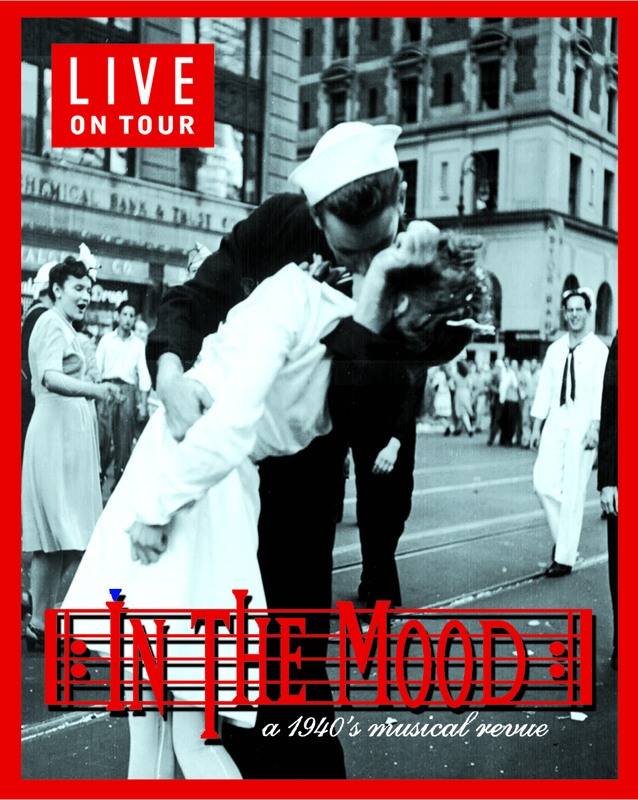 As a result, “In the Mood,” in affiliation with the USO, began a series of tours which played to audiences across the United States during the 50th Commemoration of WWII. The show's association with the National Archives and the USO was altogether appropriate, for much of the underpinning research was drawn from resources of these national organizations. 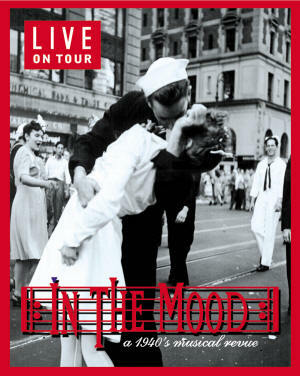 “In the Mood” has performed and toured all over the U.S.A., Canada, and Europe. In 1997, the band and singers were selected to be part of the entertainment for the 53rd Presidential Inauguration Ball. Tickets for all Fowler Center Series events may be purchased by calling (870) 972-2781 or 1-888-278-3267. Purchase tickets online at www.yourfowlercenter.com . On performance evenings, the box office in Fowler Center opens one hour prior to the event.